(TibetanReview.net, Mar22’16) – A Tibetan Election Observation Mission from the International Network of Parliamentarians on Tibet (INPAT) has on Mar 21 issued a statement, praising the exile Tibetan people for their commitment and enthusiasm in participating both in the campaign and in the voting process during the general election which had concluded the day before. It noted that voting on Mar 20, held in more than 30 countries, was conducted peacefully and overall in an orderly and calm manner despite logistical challenges. The mission members, who were former or serving members of parliaments from different countries and the European Union, said they observed no major irregularities of the election rules. The mission was made up of Hon. Thomas Mann, Member of the European Parliament and Chair of the International Network of Parliamentarians on Tibet; Hon. Andre’ Gattolin, Senator (France); Hon. Lisa Singh, Senator (Australia); Hon. Consiglio di Nino, former Senator and Chair of Canada Tibet Committee (Canada); Hon. Norman Baker, former MP and President of UK Tibet Society (UK); Hon. Matteo Mecacci, former MP, President of the International Campaign for Tibet (Italy); Ms. Zsuzsa Anna, Assistant to Laszlo Tokes Member of the European Parliament (Hungary); and Mr Bhuchung Tsering, Vice President of the International Campaign for Tibet, Washington, DC. The statement said that although the campaign was hard fought and at times personal, both candidates agreed that the elections took place on a level playing field and that no major irregularities of the election rules took place. 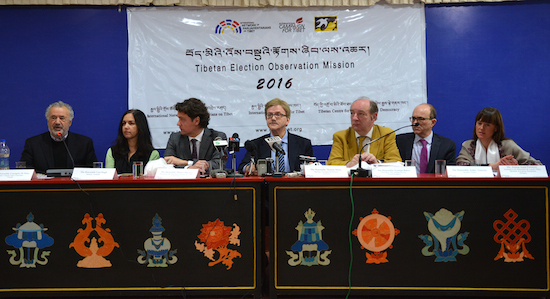 The mission said it will issue an assessment report after the declaration of the final results on Apr 27 with recommendations on issues such as campaign finance regulation with a particular focus on cap limits for electoral expenses; participation of women; regional voting system and the representation of religious sects in the parliament; and the need to ensure all Tibetans in the free world are able to vote.